It has been an exciting year at Towpath! We also saw the end of an era after 50 years of our air structures came down. So many tennis friends have been shocked by not seeing the bubbles anymore. We are stepping into a whole new era as we are about to start our 51st year of indoor tennis. It hard to believe that 50 years ago I graduated from Akron Central in 1969. That was the year Apollo 11 landed on the moon, Woodstock took place, Nixon was president, the first ATM machine was introduced, and Rod Laver was number one in the world. In 1969, I entered the University of Akron, and joined the collegiate tennis team. Little did I know that all these years later, I could say that tennis has been my passion through it all. I’m so grateful for this game and all the acquaintances and friends I’ve made throughout those years from players across the country, and the world. Tennis is such a great sport for making lifetime friends. I want to share one story of this in the next generation of friendships. Last month, I attended the induction of my son, Alex, into the Cuyahoga Valley Christian Academy Athletic Hall of Fame. He was inducted with his life-long friend and doubles partner, Lou Konstan. The pictures say it all! The first picture was taken in 2001 at our annual Thanksgiving Tournament when the boys played against each other as young juniors in the 10s division. 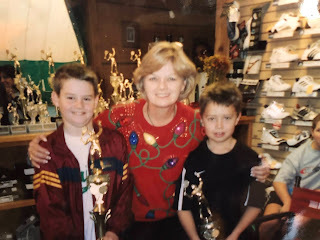 Lou and Alex are pictured with teaching professional Lois Bradford who also coached the boys during their high school tennis career. What other sport can you meet for competition when you’re 7 years old, and still play at age 90? As we turn the page to 2019, I cannot encourage you enough to introduce a youngster or an adult to tennis, play more yourself, compete and make new friends.